Like most freelance journalists these days, I do occasionally supplement my income by taking on copywriting jobs. I’ve worked, on and off, for several clients including Opal, ASUS, UK:Telco and others. It’s an ethical minefield, but I’m careful not to let it colour my judgement and make sure I offer full disclosure and avoid accepting commissions with an overt conflict of interests. It says ‘Writer and Journalist’ on my business cards – sometimes I just have to be the writer part. That side of the work is also, sometimes, a creative release. As well as press releases and news letters, I’ve worked on video scripts and blogging projects for various companies. As more of us are going freelance, we’re forced to become like proper publishing houses, erecting small Chinese walls in our minds between the commercial and classically editorial work we take on. It’s not the most tasteful part of the job, and you might accuse us of having our cake and eating it, but with mortgages to pay and editors’ budgets getting tighter by the day, it’s that or go and work in marketing full time. My latest corporate commission, though, was something out of the ordinary. For its press conference at CeBIT this year, ASUS had invited David Lewis – chief designer at Bang&OIufsen – to come on stage and talk about a project he’d collaborated on, the NX90 laptop. 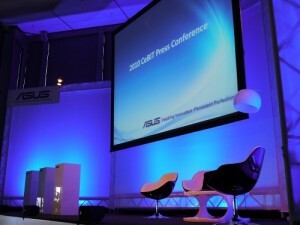 Rather than a formal powerpoint presentation, ASUS’ marketing department – who I have worked for before on a corporate blogging project – wanted to mock up a three way interview between David, ASUS chairman Jonney Shih, and a professional interviewer. And they asked me to be the interviewer. I did vacillate for a while – at least as long as I had to make up my mind – as I’m deeply uncomfortable with the idea of being a corporate shill. But I genuinely like the laptop, the offer was something unusual and challenging (and I do like a challenge) and I find it very hard to refuse any opportunity to get on stage. Even if that means standing in front of my peers and crossing a certain line, albeit temporarily. Hell, there’s plenty more famous and talented journalists than me who’ve done voice overs and adverts, and many more than you know who’ve done corporate videos the general public never sees. After I’d set my conscience straight, I had to decide what to wear, but that’s another story. Suffice to say I’m back and actually loved being on stage, and ASUS were very lovely and complimentary about my performance. It was a really interesting experience, seeing what goes on behind the scenes, and one which I’ll be able to draw on in future writing too. But I’m glad to be back on the other side of the fence again. To salve my moral conscience, tomorrow I’m off to the Red Cross to volunteer some time explaining what it was like to be a journalist in Kyrgyzstan last year.